The Action Network also shares the same address as Change to Win, the labor organizing group. Change to Win's leadership council is chaired by James P. Hoffa, president of the International Brotherhood of Teamsters. Its secretary is Mary Kay Henry, president of the SEIU. The Town Hall Project's website refers readers to the Indivisible Guide, a "practical guide for resisting the Trump agenda." The guide includes information on how to "organize local groups to fight for your congressional district" and "four local advocacy tactics that actually work." 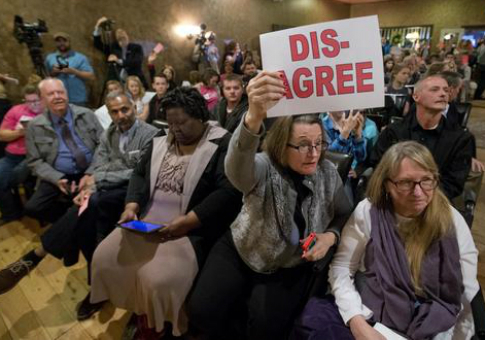 A Town Hall Project spokesman told the Washington Free Beacon that the Action Network is a service used to manage their list of volunteers and supporters and that the group would never pay any person to attend a town hall. They added that anyone is free to use their services. Update February 23, 2017, 10:40 a.m.: This post has been updated to reflect comment from the Town Hall Project. This entry was posted in Politics and tagged Progressive Movement, Protests. Bookmark the permalink.